The new 1,000 square meter 4K/UHD studio complex in Zurich is the first 4K/UHD Studios and Playout Center to be built in Switzerland. 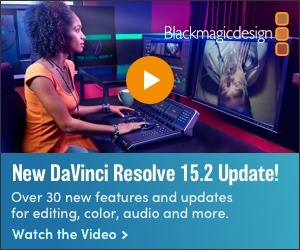 Remote studio production and virtual playout centers continue to gain traction around the world as new efficiencies and cost savings have become clear. MySports, a new 4K (UHD) pay-TV sports channel based in Switzerland, now maintains two locations—in Erlenbach and Rossens—that share video, audio and intercom signals at every level to enable precise machine control from afar. 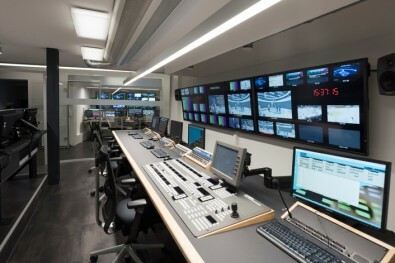 With the help of veteran German systems integrator Broadcast Solutions GmbH and engineering services provider NEP Switzerland, Swiss broadcaster MySports has deployed a new studio and Playout Center in Zürich that is tightly linked to the company's Erlenbach and Rossens facilities. Having begun broadcasting from its headquarters in Erlenbach near Zürich in mid-November, MySports is now producing its programming from a broadcast center in the former Schärer factory on Lake Zürich and a satellite studio in Rossens. NEP Switzerland was responsible for the planning and construction of the complex, and is in charge of day-to-day operations acting as a production service provider. The 1,000 square meter 4K/UHD studio complex is the first 4K/UHD studio and playout center to be built in Switzerland. Together with two 4K/UHD OB vans, also conceived and delivered by Broadcast Solutions, NEP Switzerland is now offering a complete 4K production, studio and playout workflow to its customers around the world. Connectivity between the facilities is accomplished over two redundant 100 GigE fiber-optic connections that are available as WANs, with the studio and playout center located in Zürich and the remote studio based in Rossens (the French-speaking part of Switzerland). Broadcast Solutions managed planning and installation of all broadcast (SDI) and IT (IP) infrastructure as well as all of the production furniture. The entire system went live in the fall of 2017; in time for the 2017/2018 professional hockey league season; including the popular Swiss National League, the Russian KHL and the Swedish Hockey League. MySports also carries Bundesliga football, handball, basketball, winter sports and large eSports events broadcasts. The first live UHD broadcast took place in November, an ice hockey game, in 3,840 x 2,160 resolution. 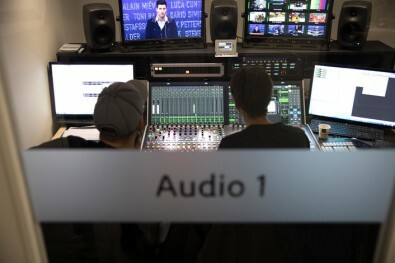 MySports studios are built identically, with the Rossens studio being remotely controlled from the Zürich studio (pictured). MySports is now producing all ice hockey games as multi-language programs with a minimum of two languages. The studio in Zürich will cover the German and Italian signals whereas the remote studio in Rossens will produce French programming. Both studios are built identically, with the Rossens studio being remotely controlled from the Zürich studio. The Zürich playout center will work with 20 channels of live signals to support four HD channels and two 4K/UHD channels. This includes seven bilingual event channels for sports broadcasts, and at each location, two bilingual pay-TV channels, two bilingual free-TV channels and two bilingual UHD channels. Talking about the diversity of languages, six Riedel MediorNet MicroN systems are used for audio feed shuffling and as program embedders. Depending on the region of the transmission, the channel assignment is often different: sometimes Italian is on track 1 and French on track 2, and sometimes French, sometimes German. This track assigning is sorted by the feed shuffler to meet the house standard before it is released for transmission. Technology suppliers for the innovative remote production infrastructure include Bolero Wireless, Cisco, Evertz Microsystems, EVS, Grass Valley, Net Insight, Lawo, and Riedel Communications. Grass Valley’s iTX system manages the 20 channels, which also rely on Grass Valley Vertigo graphics. EVS servers help move content back and forth while Lawo mc²56 and mc²36 audio consoles handle the audio at both the Rossens and Zürich locations. Distributed storage systems were supplied by RedHat software via its Gluster FS, an open source software that was provided by NEP Switzerland. For the studio and playout installation, NEP Switzerland chose 4K cameras, video production switchers, routers, multiviewers and playout solutions from Grass Valley. In the playout center, this includes Grass Valley's iTX integrated playout platform, while for video between the sites there are Grass Valley Densité IP-Gateways. For audio production in the studios and transporting audio between the sites, MySports is using an IP-based Ravenna/AES67 audio network with Lawo audio cores, Lawo mixing consoles and Lawo Commentary Units (LCUs). Overall video and audio signal routing is controlled by a Lawo VSM (Virtual Studio Manager) system. Riedel Bolero, Artist and MediorNet systems provide communication between and within the locations, for studio, production and editors. For network control, Broadcast Solutions has implemented several network control and monitoring tools that allow remote intervention. The Rossens location includes six Lawo LCUs for the on-air commentators in both locations and two A__mic8 units (an Audio-to-IP interface) using a Ravenna Audio-IO Interface for connecting the studio microphones and the in-ear monitoring systems. There is also a Riedel intercom system consisting of one Artist 128 matrix with two AES67-compatible client cards that connect eight RSP2318 smart panels (4 per site) and a Bolero Wireless intercom system with a total of 8 beltpacks (4 per site). The terminal equipment in Rossens and Zürich are connected via a Cisco SG300 PoE switch. From there the network finds its way via one Cisco Nexus 9K switch per location and the 100Gbs uplink provided by UPC Cablecom in Switzerland. Each terminal can be controlled via one of the Lawo consoles located in the network. A Distributed Studio Network (DSN) was deployed with the support of Lawo that also allows highly reliable corresponding rights management of the terminals via the GUI of one of the Lawo mixing console. The audio stream between the sites runs alongside a multicast stream. Audio networking is supported by Precision Time Protocol version 2 synchronization because all devices on the audio network need an accurate clock to work properly in tandem. An important note, the audio networking relies heavily on Precision Time Protocol version 2 (PTPv2) synchronization because all devices on the audio network need an accurate clock to work properly in tandem. The MySports system uses an Evertz SPG MSC5700 IP unit as PTPv2 grandmaster. Two more SPGs of the same type are configured as a standby grandmaster. The prioritization of the potential PTPv2 grandmaster—which could also be a Lawo mc²56 or a Nova37 console—ensures that only one grandmaster is active in the system. Two Nexus 9K switches at each site are configured as boundary clocks. A boundary clock passes the PTPv2 time information of the SPG through to the end devices and can compensate for its own switch cycle time by adding new timestamps to the time packets, taking into account their own cycle time. Thus, a stable synchronization of the devices located in the audio of less than 1μs (microsecond) can be realized. In general, those involved said that what makes the network special is its structure. On the one hand the network provides Link Aggregation Control Protocol (LACP) devices with a virtual gateway and allows redundancy of the main switches. The connection offers highly reliability, thanks to the Hot Standby Router Protocol (HSRP) and a redundant 100 Gbps connection between the sites. In addition, to operate some Lawo and Riedel components, the engineers have designed a system that uses an active/standby configuration of Evertz SPGs for the channel’s PTP service. The switches, acting as boundary clocks, across both sites and can be easily adjusted from a single location if necessary, provide the same service. Using SNMP network monitoring, Broadcast Solutions has implemented a read/write web interface for configuring all ports, which provides real-time monitoring throughout the network infrastructure of all ports of all installed switches. In this system, any information about the switch port or the device behind it (bandwidth, discarded data packets, VLAN ID, IP, Mac address, etc.) can be detected and corrected instantly. The Link Aggregation Control Protocol (LACP), a subcomponent of the IEEE 802.3ad standard, provides additional functionality for link aggregation groups (LAGs). They use the link aggregation feature to aggregate one or more Ethernet interfaces to form a logical point-to-point link, which is known as a LAG, virtual link, or bundle. By combining the studio/playout complex in Erlenbach with the studio in Rossens, the interoperation of both locations provides MySports with a comprehensive remote production environment. Using the latest technology and productive workflows, the facilities are easily upgradable to accommodate future technical innovations as they become available. And the significant reduction in resources has allowed MySports to produce more content, faster and with better efficiency than ever before.